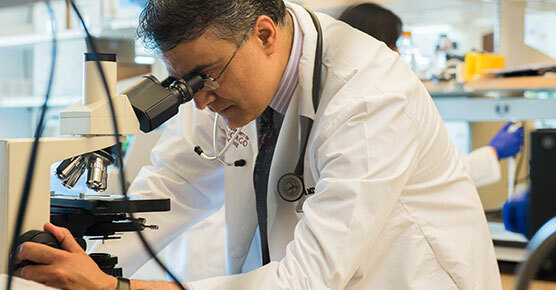 At the University of Chicago Medicine Comer Children's Hospital, we strive to translate fundamental scientific discoveries into better care for patients. Collaboration is at the core of our identity as an academic medical center. Our work uncovers better treatments for diseases, which helps health care professionals around the world. And it gives our patients access to new treatments and therapies at the forefront of medicine. We’re committed to advancing discoveries that transform our patients’ lives and expand our physicians’ knowledge. We perform more clinical trials than any other hospital in Illinois. Let us help you find the one that's right for you. Our physician-scientists work on hundreds of research studies and clinical trials to increase our understanding of pediatric disease and its treatment. These studies help to shape national standards of care for infants to young adults. John M. Cunningham, MD, chair of the Department of Pediatrics and physician-in chief at Comer Children’s, shares clinical and research achievements. Hi, and welcome to the University of Chicago Medicine Comer Children's Hospital. I am John Cunningham, Chair of the Department of Pediatrics at the University and Physician in Chief of Comer Children's. When I came to the United States after training in Ireland and England as a hematologist, my dream was to cure sickle cell disease, a truly devastating disease of childhood. Now at Comer Children's that aspiration has been realized with hematopoietic stem cell transplantation. With 15 transplant physicians we have the largest stem cell transplant program in the region and we are particularly expert at using that sibling and other stem cell donors to successfully cure children and adults with sickle cell disease. In the very near future we anticipate offering a novel engineered stem cell transplant that we believe will minimize complications such as graft versus host disease and allow parents to become stem cell donors to their sick children. We set a high bar at Comer Children's for exceeding current clinical outcomes for all childhood diseases. We have the largest clinic for neurofibromatosis in the country and we're leading research efforts into new treatments with multiple clinical trials underway. For children with epilepsy we are only one of two health care systems in Illinois offering ketogenic diets, which have been shown to dramatically reduce epileptic seizures in children. And some of our patients are now seizure free. But we aspire even higher. Our basic science research on the mechanisms that govern epilepsy has promising potential to stop seizures before they occur. We strive to be at the forefront of innovation in pediatric medicine. Our neonatologists are among the first researchers to examine the impact of a healthy microbiome on early brain and intestinal development, giving us insight into how to modify the microbiome in pre-term infants to improve their outcomes. We make each child a promise when he or she becomes a patient here, that we will individualize care to each child's specific needs and those of each family. We understand that building trusting relationships with providers is vital for children to achieve optimal outcomes from their care. We are committed to providing compassionate care and to treat the whole child ever mindful of each child's dignity and individuality. Our child life specialists, for example, assess every child who is hospitalized to ensure that care aligns with the child's development and psychosocial needs and to help children achieve mastery over their health care experience. We are also the first pediatric hospital in Chicago certified to offer the FDA approved CAR t-cell immunotherapy for children with acute lymphoblastic leukemia, or ALL. CAR t-cell therapy is truly revolutionizing the treatment of acute lymphoblastic leukemia. And now our goal is to develop similar treatments to eradicate all forms of cancer. Comer Children's Hospital is also the only center in Illinois and surrounding states to offer radio labeled MIBG therapy for children with relapse neuroblastoma. We've recently opened a phase three study to evaluate the efficacy of MIBG therapy in kids with newly diagnosed high risk neuroblastoma and to try to improve survival for this group of children. Comer Children's Hospital is a 165 bed pediatric hospital with 30 ICU beds, 55 level three NICU beds, and a level one pediatric trauma center. Our faculty, which includes more than 130 full-time faculty members and post-doctor researcher's is second to none. 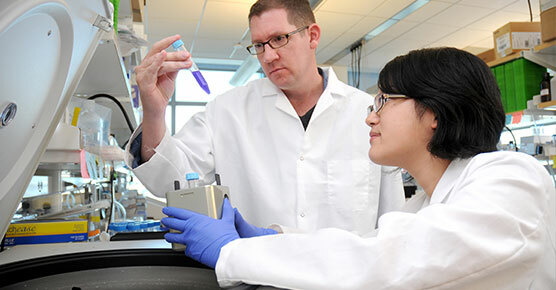 Because of our affiliation with the University of Chicago and our site on the University of Chicago campus, our faculty collaborates with internationally renowned scientists and has access to world class research facilities, which facilitate cutting edge translational and clinical research and discoveries to be brought quickly to the clinic. In 2017 alone, our department's research awards from the NIH, CDC, and other sponsors have totaled more than $15 million. We seek clinical excellence from everyone in the department in order that we fulfill our promise of providing brighter tomorrow's for the children we treat today.